"Thanks for creating this amazing tool Marti..."
-Bug: Delete UVs, Cut UVs, Split UVs, Sew UVs and Move and Sew UVs no longer fail on multi-mesh selections. -Bug: Legacy Unfold no longer fails on multi-mesh selections. -Bug: The unfolding speed of Unfold U/V -only has been fixed. -Bug: Pre-scaling UV's (Unfold UV's) has been fixed. -Bug: Fixed a bug with the legacy Unfold UI which caused the Unfold U/V only -setting to fail. -Bug: Fixed a bug which caused the the legacy Optimize UV's (Relax) to behave in a weird way. -Legacy: The areaWeight -flag of the legacy Unfold UV's has been removed from NSUV as it was causing performance problems that can only be fixed by Autodesk. -UI: Pin UV shell border is now turned off by default for the legacy Optimize UV's (relax) as it caused confusion among users. -New: Multi-Stitch! "Stitch Shells" has been vastly improved and now work on multi-edge selections spanning over multiple shells!. -New: Stitch will now always stitch the smaller shell to the largest when the user use the left mouse button - and vice versa for the right mouse button. -New: Multi-tile (UDIM) support has been added to Snapshot UV's. -New: Match UV's has been vastly improved and now has a much better matching -algorithm. It is now approximately 50 times faster than the old Match UV's! -New: Get TD and Set TD now works on any selection (mesh, edge, face, vert, UV). Additionally, Get TD will calculate and get the average TD of all the faces! -New: It is now possible to store component and mesh selections in variables. Left/Right -click the A and B icons on the top bar to load/save a selection. -New: NSUV now displays a welcome screen when being run for the first time (contains a button for creating a NSUV-icon on the active shelf!). -New: NSUV now displays "Tip of the Day" every time it starts up (it can be turned off). The TotD will inform the user about various neat features in NSUV. -New: UV Editor Display Settings -window. Gathers all display settings in one place. -New: It is now possible to individually normalize all shells in a selection. (Normalize UVs options). -UI: The "Unwrap" frame has been removed and replaced by two new frames: "Cut/Sew" and "Unfold". -UI: The Align Shells -buttons have been gathered under ONE icon (via right-click menu). -UI: The Align UV's -buttons have been gathered under ONE icon (via right-click menu). -UI: The Pivot Cycling -buttons have been gathered under ONE icon (via right-click menu). -UI: The Calculate Distance and Angle -buttons have been gathered under ONE icon (via right-click menu). -UI: Distribute Shells is now gathered under ONE button and has an options window on right-click. -UI: Layout Shells is now gathered under ONE button and has a custom options window on right-click. Supports the new Unfold3D -stuff from 2016 Extension 2. 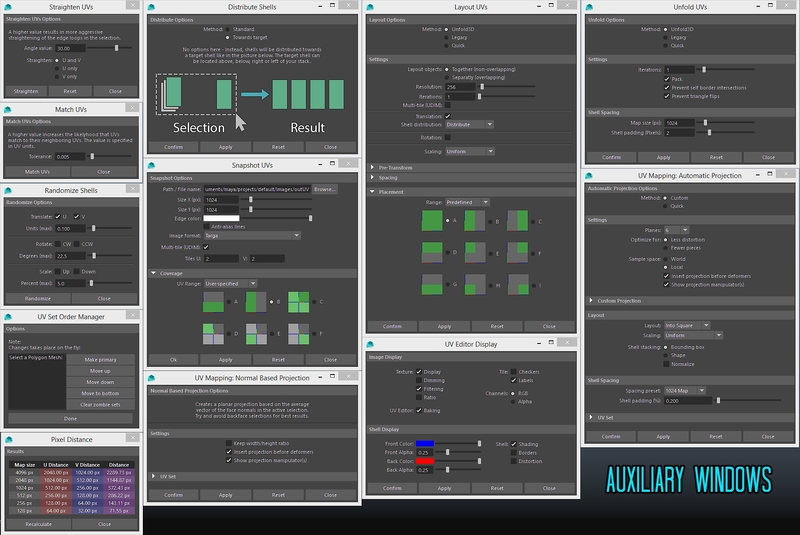 -UI: Normalize/Unitize UVs now has a custom options window. -UI: The Polygons menu has been reworked. Now all menu items go to NSUV functions instead of native ones. Some abundant icons have been removed as well. -UI: The Image menu has been renamed "Display" and now contains all display toggles also available on the visibility bar. -UI: The Selection menu has been revamped and now contains even more selection options. -UI: Some items on the "View" menu has been moved to the "Display" menu. 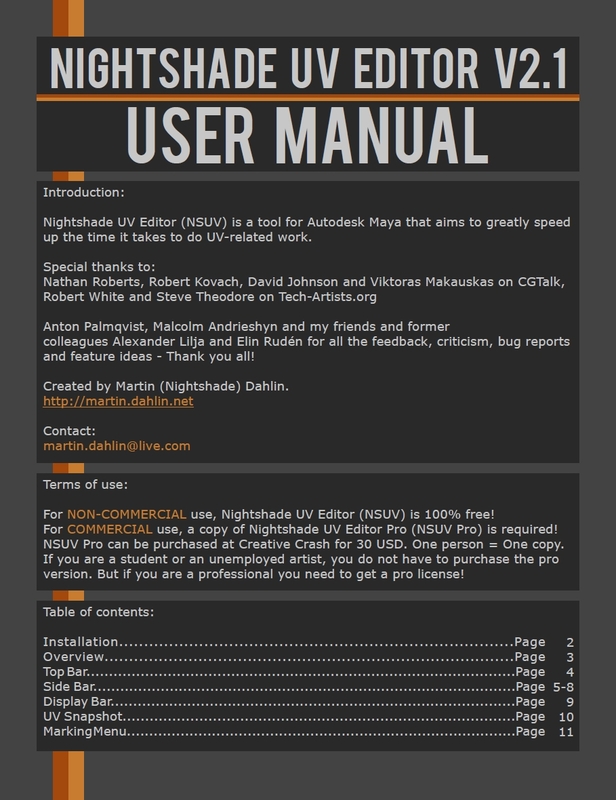 -UI: You can now open up the NSUV manual via the NSUV menu. 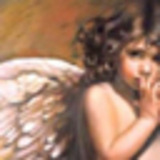 -Bugfix: NSUV will no longer load the UI module before the optVars module, resulting in "KeyError". -Bugfix: Copy UV Set now works as it's supposed to. -Bugfix: Duplicate entires should no longer appear in the UV Set Editor list or the Copy UV set list. -Bugfix: When duplicating UV sets, the new name is always based on the current and the name is always incremented properly. -Bugfix: Clicking a UV set in the UV set list when you have a UV selection no longer clears the selection. -Bugfix: "Snap Shells (A->B)" has been fixed. Previously it would incorrectly act on border UV's only - but now it will act on entire shells as expected. -Bugfix: Fixed a calculation error when distributing shells towards a target. -Bugfix: Fixed a bug with the icon group toggles on the visibility bar. -Bugfix: The reset button on the Relax/Optimize UI now works properly. 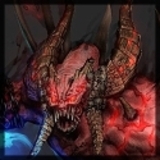 -Bugfix: When using Select: "Contained Faces" or "Connected Faces" you will no longer get stuck with a multi-component selection. Additionally the selection type will switch over to faces. -Bugfix: The scale value of Randomize Shells should no longer be cast as an int by mistake when using a float ending with 0. -Bugfix: Clicking reset in the UV snapshot window will no longer prevent the window from popping up. -Bugfix: The UV Snapshot window will no longer generate files with double extensions. -Misc: All UV editor features that are new in Maya 2016 ext 2 has been added in NSUV (Symmetry and Auto Seams). -Misc: Automatic mapping and Planar mapping now projects UV's with "keep image ratio" on by default. -Misc: The Planar Map popup menu is now available on Right Click instead of Left Click. Left click will perform a planar map using the last options used. -Misc: The Copy UV Set popup menu is now available on Right Click instead of Left Click. Left click will perform a Copy using the last options used. -Misc: All projection shortcuts on the marking menu now have option boxes. -Misc: Normal-based mapping will now do a quick unfold and orient shells after projecting the UV's, and no longer convert the selection to the mesh. -Misc: Flipped the filtered image display option. You are now actually turning on filtered display (smoothing) instead of turning on UNfiltering which is confusing. -Misc: Improved shelf button. The shelf button script now properly closes down the native UV Editor if it exists. 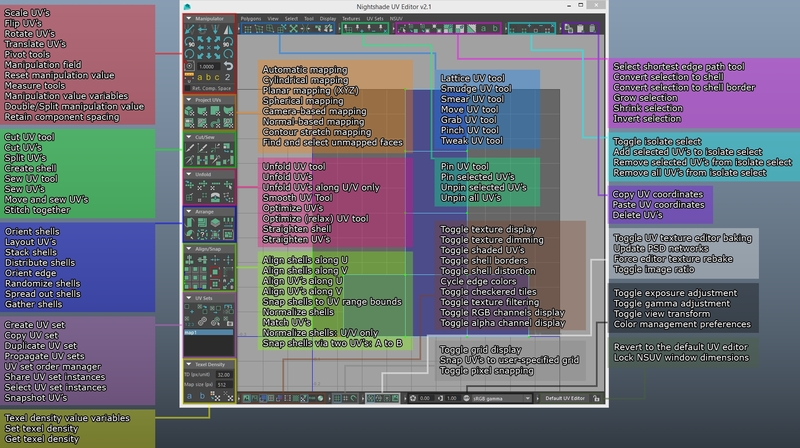 -Misc: It is now possible to access the move/sculpt UV -tool brush options by right clicking said icons. -Misc: Randomize shells now randomize translation by default to avoid confusion (users reported it not working with the default settings). -Misc: The lowest translation value for Randomize Shells has been lowered from 0.01 to 0.001. -Misc: Set TD and Stack UVs now works on face selections. -Misc: panel.mel and toolbar.mel has been completely rewritten in PyMEL. -Misc: All windows in NSUV are now sizeable. -Misc: NSUV will now check your selection for polygon components before doing isolate select: add or remove. -Misc: The UV Set icons have been adjusted to be more in line with the native UV Set icons. -Deprecated: All support for NURBs UVs have been dropped for the sole reason that their implementation in Maya (by Autodesk) has always been exceptionally poor. -Deprecated: All support for the legacy subdiv -surfaces have been dropped. (Deprecated by Autodesk in 2012 anyways). -Deprecated: Support for Maya 2012 has officially been dropped. However, NSUV will still launch in 2012 and most features (99.9%) will still work. -Advanced UV manipulator: Less typing, more options. -Orient shells: Orients shells straight. -Orient edge: Orient UV shell(s) around a UV/edge selection. -Stack shells: Stack shells on top of each other. -Match shells: Match UV's to their closest neighbors. -Straighten shell: Straighten edge loop and unfold shell around it. -Straighten UV's: Straighten all edge loops in a UV selection. -Multi-Stitch: Move, sew and scale like in 3D Studio Max (Stitch selected). -Randomize shells: Randomize shells individually. -Align UV's to min, max or average U or V.
-Align shells to min, max or average U or V.
-Snap shells to the UV range bounds (eight directions +center). -Snap shells A to B: Connects two shells via two UV's. -Spread shells: Unstangles and unstacks your shells neatly. -Gather shells: Offset back shells that are outside the 0->1 range. -Unfold UV's along U/V only with the click of a button. -Normalize shells: Normalize along U, V, UV or UV with stretch. -Layout UV's along a U or V -strip. -Structured and logical user-interface with 4k resolution support. -Custom Unfold/Relax/Layout/Normalize windows with extended options. 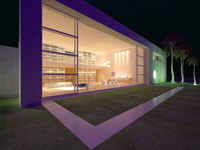 -Extended UV projection tools, such as normal-based mapping. -New powerful snapshot window with multi-tile/UDIM support, and the ability to easily make 2:1 ratio snapshots. 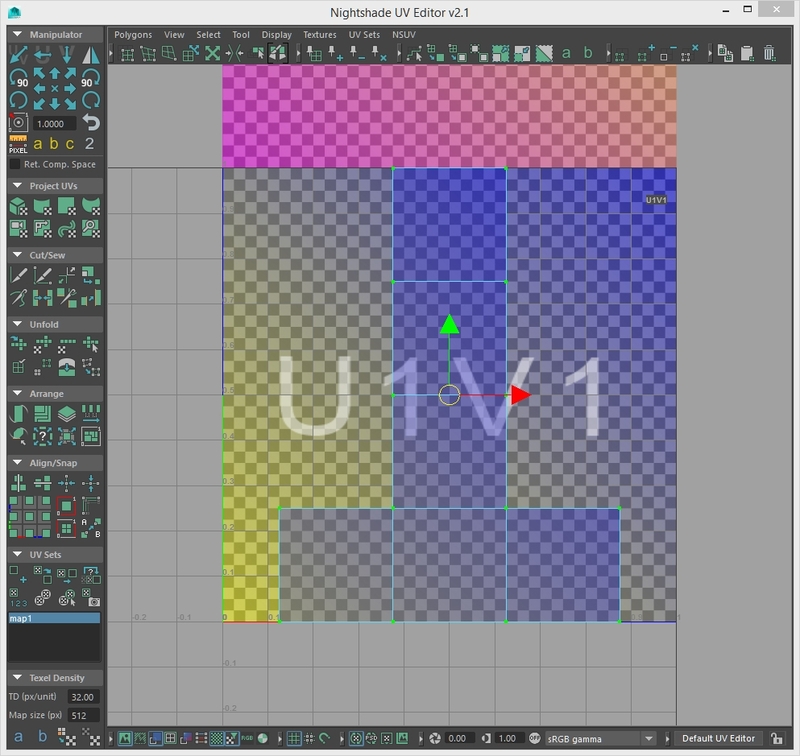 -Integrated UV Set Editor: Native functionality fully implemented. -Texel density control: Scales shells to the same texel density. -Fetch texel density from any face selection. -Rotate, scale, transform and flip shells around custom pivots. -Relative rotate/scale: Rotate/scale shells around their own pivots. -Cycle pivot point position around the four corners of the selection bounding box or the UV range bounds. -Measure the distance between two UV coords: in pixels or units. -Calculate angle between two UV coords. -Checkbox for the "Retain component spacing" -option. -Buttons for saving/loading component selections. -Buttons for Copy, Paste and Delete UV's. -Buttons for pinning UV's (Maya 2016 and later only). -NSUV top menu with a workflow guide as well as tips and tricks. -Custom UV display window that collects all editor and shell display options in one place. -Cycle edge colors: Change color on selected edges. 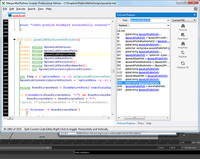 The free version of Nightshade UV Editor (intended for NON-COMMERCIAL use) is licensed under Creative CommonsAttribution-NoDerivatives 4.0 International (CC BY-ND 4.0). For the legal version of that license including a human-readable format of that license, please visit Creative Commons official website. For COMMERCIAL use of Nightshade UV Editor - such as for freelance work or in a studio/production environment - you are required to purchase the pro version available on this page! 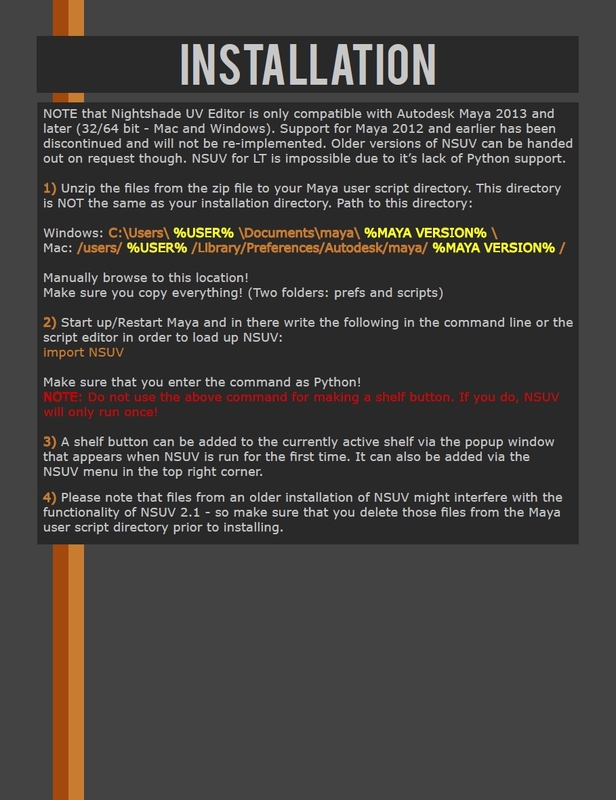 NOTE that Nightshade UV Editor is only compatible with Autodesk Maya 2013 and later (32/64 bit - Mac and Windows). Support for Maya 2012 and earlier has been discontinued and will not be re-implemented. Older versions of NSUV can be handed out on request though. NSUV for LT is impossible due to it’s lack of Python support. Manually browse to this location! 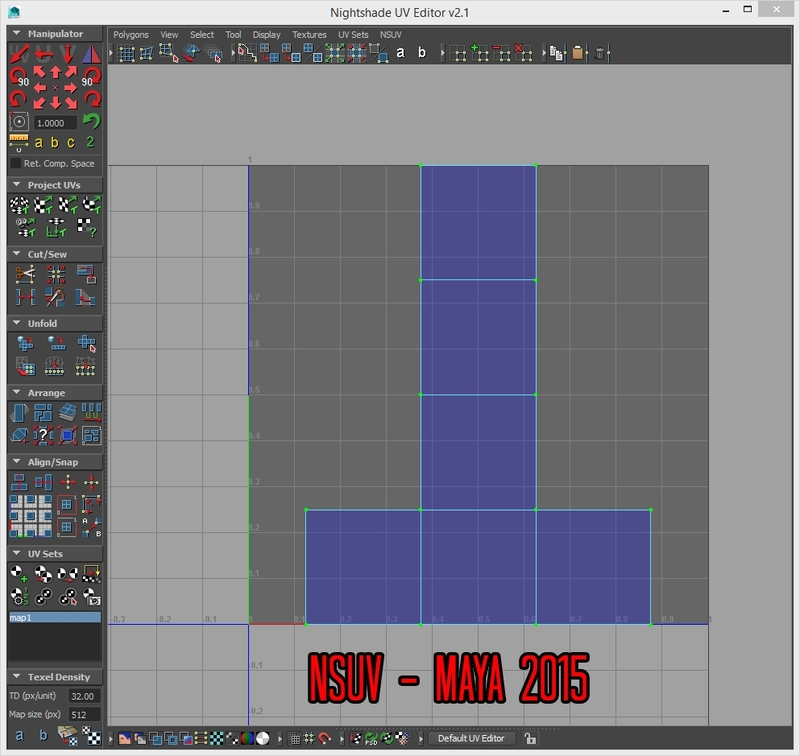 2) Start up/Restart Maya and in there write the following in the command line or the script editor in order to load up NSUV: import NSUV Make sure that you enter the command as Python! 3) A welcome screen pops up. Make sure you PRESS the button to create a shelf icon! The shelf icon is needed for closing/starting NSUV! You cannot make a button from just "import NSUV"! 4) Please note that files from an older installation of NSUV might interfere with the functionality of NSUV 2.0 - so make sure that you delete those files from the Maya user script directory prior to installing. Q: Will NSUV interfere with other UV Editors that I use? A: No, it will not! NSUV does not modify any native files! Additionally NSUV comes with a button for quickly switching to the native editor if/when you need it.NOTE: if your studio is using in-house scripts/tools hacked into the native Maya Editor, then you need to edit some rows in core.py for sourcing a custom script.More instructions are located in core.py under the function defaultEditor(). Q: Why does NSUV cost money now all of a sudden? A: Two reasons: NSUV development takes up a lot of my free time and as we all know it, time equals money. The second reason is that NSUV helps other making more money (by speeding up their workflow). Therefore it is only fair that I get something back for offering a tool which provides other game developers to make money/save time. NSUV is still 100% free for students, amateurs and unemployed game developers working on their portfolios. Personal non-commercial projects does not require the Pro version of NSUV, and never will! I've been a poor student myself so I know the importance of good, free tools. Q: I donated money in the past when NSUV was 100% free. Do I need to purchase the pro version? A: No. If you you previously donated money to NSUV while it was 100% free, you got yourself a lifetime license of NSUV Pro automagically. Q: What are the differences between NSUV and NSUV Pro? A: As of now, only the license. Both versions have the same features. However, NSUV Pro is required for commercial use. 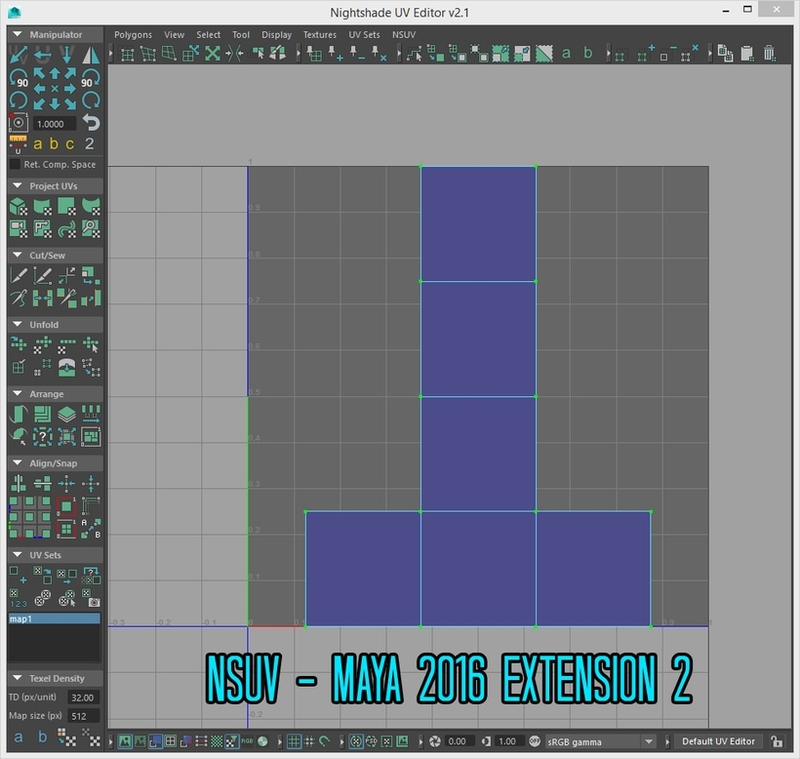 Q: Does Nightshade UV Editor work for my version of Maya? A: As of now, v2.0 works for all versions from 2012 to 2015 - for both 32 and 64 bit versions of Windows (tested and verified) as well as Macintosh (untested). Maya LT support is impossible because Autodesk does not think Maya LT should have Python interpreter. Older versions of NSUV (running MEL - which work for Maya LT) can be handed out on request. The last version running on MEL was 1.4.1. Q: How do I flip shells vertically? A: Right-click the Flip UV's icon. Keep in mind that many icons in NSUV have double functionality like this. Other examples are Unfold Along U/V and Normalize Along U/V. Q: Unfolding doesn't work properly, what is wrong? 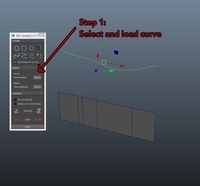 A: By default the Unfold feature runs using the Unfold3D -method introduced in Maya 2015. Right-click the Unfold icon and change the method to "Quick" to make it behave like the Unfold along U/V -only feature. Q: How do I use variables for the manipulator and texel density fields? A: Right-click an icon to WRITE a value and left-click it to READ a stored value. Q: How do I copy a UV Set with the integrated UV Set Editor? A: Click and hold the button on the copy icon. A popup menu will appear. Q: How do I do a planar projection or access the planar projection options? Q: How do I rename a UV set? A: Double-click it in the UV set list. Q: NSUV is taking up too much screen space, how can I make it smaller? A: The window is scalable and the frames and icon groups can all be collapsed (hidden). Q: Where are the U and V input fields? A: NSUV only has one general-purpose field. Use it for both U and V manipulations. Q: Running Straighten shell doesn't work, what's wrong? A: Make sure that you have a legal selection active, such as no edges shared by two shells. See the manual for details. Q: Icons are missing! How do I get them back? A: You forgot to copy the prefs -folder from the NSUV zip file. Q: How do I reset all settings in NSUV? NOTE: that the window sizes and positions are not reset. Those settings are stored in a file native to Maya called windowPrefs.mel located in the Maya user script directory under the "prefs" folder! Q: NSUV crashes during import, what is wrong? Q: My question isn't answered here, where can I send it? You can contact me directly via Creative Crash or via my portfolio website(Google: Martin Dahlin 3D Artist). If you like this tool then make sure to check out my other creations here on Creative Crash.